Officials confirmed a body had been recovered from the jetty following the explosion as firefighters at the scene battle to put out the blaze. The body of Shahril Azmi bin Baharudin, 28, from Malacca, has been taken to the Labuan Nucleus Hospital. Shahril Azmi bin Baharudin, Malaysian, 28 yrs, Male, Malacca. Body taken to Labuan Nucleus Hospital. Police, Firefighting & Rescue Services, Hospital, APPM, Marine Police, Marine Department, RMAF, JPAM, Environmental and Occupational Health and Safety Department. 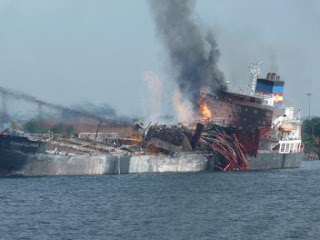 The ship could be seen listing following the fire and explosion that rattled Labuan. Search and rescue crew were also scrambling to locate the missing persons. Meanwhile, in a statement, Petronas Chemicals Group Berhad said that it was undertaking all necessary action to ensure the safety of all personnel at its subsidiary, Petronas Chemicals Methanol Sdn Bhd, where the fire incident took place. Following the incident, the operations of the Patau-Patau Power Station owned by Sabah Electricity Sdn Bhd (SESB) located adjacent to the terminal was temporarily halted for safety reasons. SESB managing director Abdul Razak Sallim said this was to enable the fire and rescue personnel to take the necessary preventive and safety measures. The channelling of gas from Petronas Chemicals Methanol to the Patau-Patau power station was stopped immediately until after the situation returned to normal and it was safe, he said in a statement. Abdul Razak said the temporary shutdown was expected to affect SESB’s capability to channel electricity to all consumers in Labuan. He also said that several emergency measures to meet the shortfall in electricity generation capacity would be implemented, including Demand Side Management (DSM), during the period of peak demand. Rationing of electricity supply would only be implemented in stages if the implementation of the DSM was unable to cope with the demand and the station could not operate at optimum capacity, he said. The Patau-Patau Power Station has the capacity to generate 103.5MW of electricity, and is the only power station in the Federal Territory of Labuan. Meanwhile it is understood that Petronas staff at the silo are on alert for any eventuality, including evacuation. It is also learnt that residents from the nearby Patau-Patau and Rancha-Rancha residential areas have also been placed on high alert, with the possibility of evacuation. It was earlier reported that the tanker Bunga Alpinia 3, registered in Port Klang to MSC, sustained a freak lightning strike around 2.30am which set the ship ablaze. 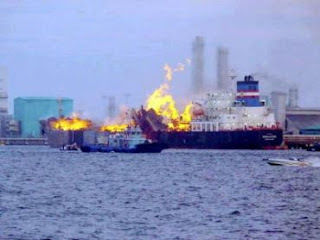 KUALA LUMPUR: A fire broke out early today on board an MISC Berhad chemical/palm oil tanker in Labuan, Sabah, MISC said in a statement according to Bernama. It said the Bunga Alpinia, a 38,000 DWT IMO II vessel, had 29 crew, comprising 23 Malaysians and six Filipinos. “At present, 24 (crew) have been safely brought ashore while five are still unaccounted for,” MISC said. The vessel was alongside the Petronas Methanol Sdn Bhd terminal in Labuan when the incident took place at about 2.30 am. “No further details of the incident are available at this point,” the statement said. It added that all authorities had been notified accordingly and MISC was working closely to render necessary assistance. KUCHING: Five were reported missing after an explosion ripped through a methanol tanker at about 2.30am in Labuan. The incident started when a fire broke out on board the tanker moored alongside the Petronas jetty in Labuan. Twenty-seven of 32 people were within the vicinity of the area, including those on board the tanker, have been accounted for. The five missing people were believed to have been on board the tanker and had jumped overboard when the fire broke out. Firemen who rushed to the scene were forced to withdraw when a series of explosions occurred. No official statement has been released yet. 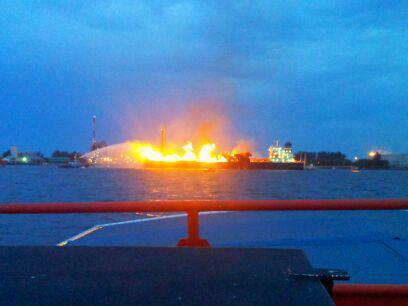 KUCHING: A chemical tanker Bunga Alpinia exploded at the port of Labuan near the Petronas Complex about 2.30am this morning. The vessel was believed to have been struck by lightning and unconfirmed reports claimed the explosions could be heard from as far as Batu Arang. No reports of casualties are known at press time.